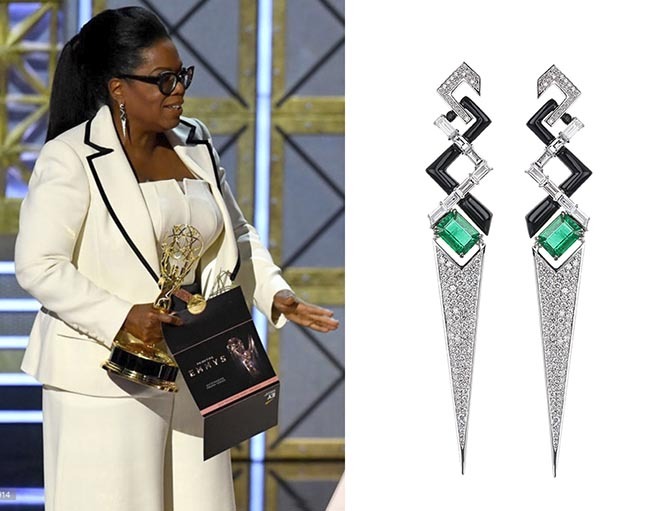 At the Emmys last September, the first event of Awards Season, Oprah Winfrey wore a pair of pendant earrings by Nikos Koulis. For most designers, this one moment would have been enough to call their entire season a great success. Nikos Koulis, however, is not most designers. He went on to bejewel any number of stars at all kinds of events. The masterful diamond creations from the Greek super talent proved to be the perfect choice time and again. Some of the earrings were even worn repeatedly, something that only happens when a design is truly special. 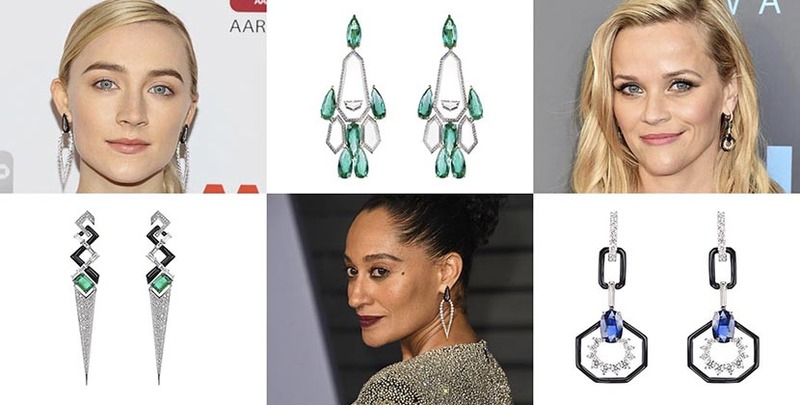 So, what is it about jewels by Nikos Koulis that make them such a popular choice for celebrities? A lot of elements add up to the irresistible whole. The Art Deco style of New York architecture, one of his sources of inspiration, infuses the spirit of beautiful vintage to his work. Specifically, he sets variously shaped diamonds to highlight the angles, a flourish found in deco pieces. Black enamel adds a graphic detail. Emeralds and sapphires provide pops of color. Transparent enamel in some jewels show off a rare manufacturing expertise. Nikos’ jewels are the perfect blend of edgy and elegant. They are also incredibly versatile. The designs can be worn with gowns or a pantsuit to formal red carpets or cocktail parties at the Chateau Marmont. Just look at all the different women who wore Nikos Koulis to events over the course of the last several months. 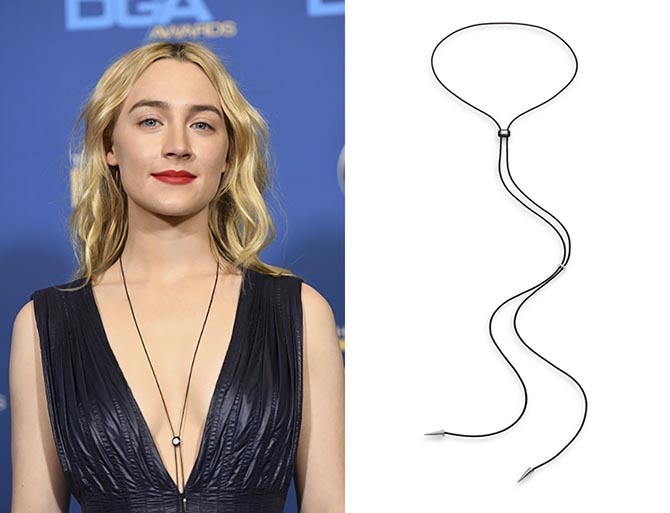 One glance and it is easy to see why the designer was the jewelry star of Awards Season. 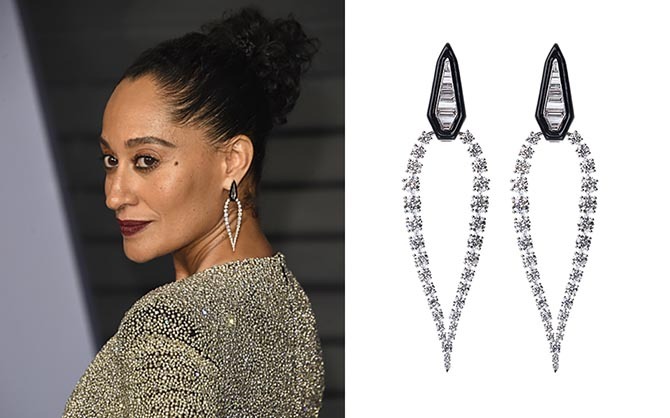 Tracee Ellis Ross in Nikos Koulis diamond and black enamel earrings at the 2018 Vanity Fair Oscar Party. 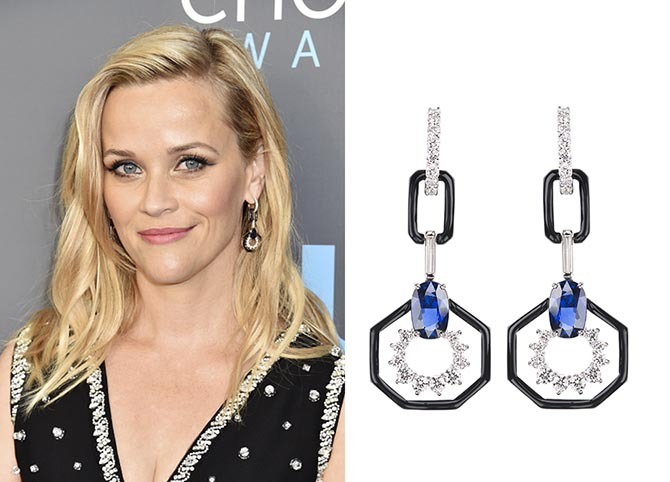 Reese Witherspoon in Nikos Koulis diamond, sapphire and black enamel earrings at The 23rd Annual Critics’ Choice Awards. 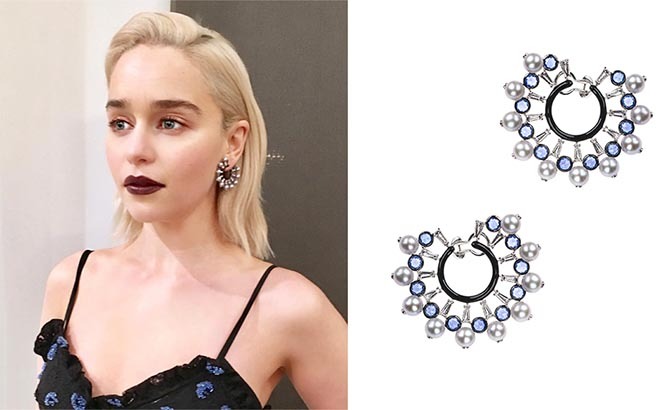 Emilia Clarke in Nikos Koulis diamonds, sapphire, pearl and black enamel earrings at the W Magazine Golden Globes party. 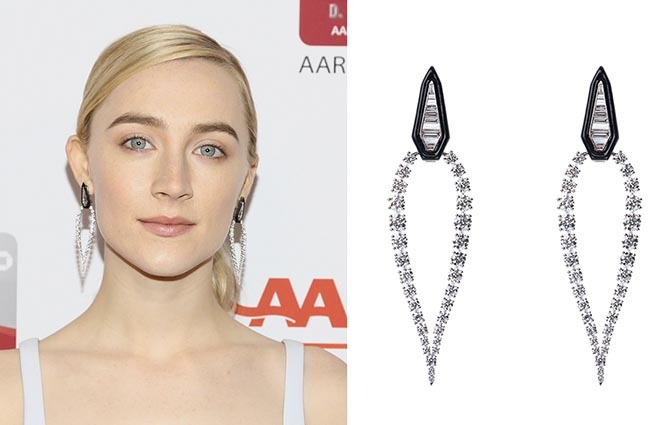 Saoirse Ronan in Nikos Koulis diamond and black enamel earrings at the AARP’s 17th Annual Movies For Grownups Awards. 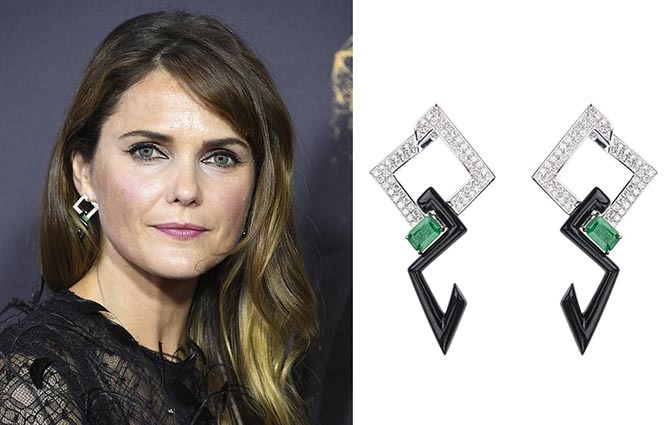 Keri Russell in Nikos Koulis diamond, emerald and black enamel earrings at the 69th Annual Primetime Emmy Awards. 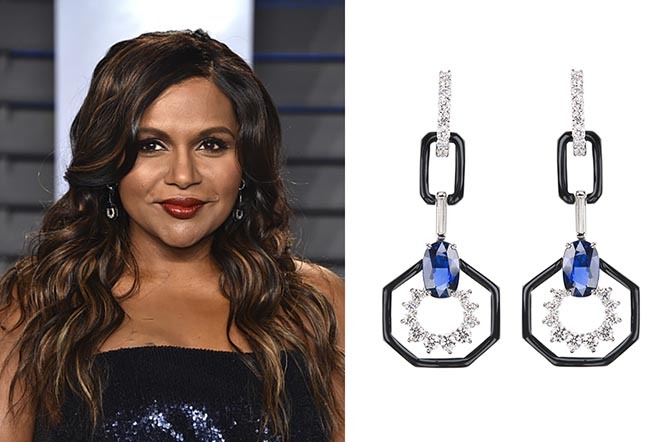 Mindy Kaling in Nikos Koulis diamond, sapphire and enamel earrings at the 2018 Vanity Fair Oscar Party.